The seawall was not breached at South Cove. The water level was measured to be within 50 inches of top of the wall at Albany and the wall is at least a foot lower a block south. This image shows the water just after high tide this morning (we often will sit and read on the benches nearly covered by water). These two slideshows (NY Times slideshow, and NY Times Readers Photos) provide a bit of explanation and justification for the evacuations and response by local government. 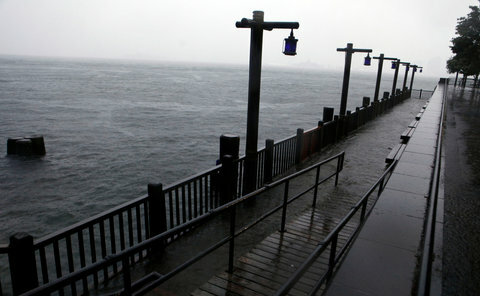 The consensus of theories among our fellow residents of Battery Park is that there was pressure from FEMA and the federal government to avoid a repeat of Katrina along with severely botched response to the Christmas Day blizzard left the Bloomberg administration with very little choice but to be aggressively cautious with Irene. Despite the cautious stance, it is easy to see how very different this scenario would have been with as little as an additional 4 feet of water during the storm surge.